For expert air conditioning repairs in Flowery Branch, turn to the professionals at ClimateSmith, LLC. As one of the leading HVAC companies in Georgia, we offer top quality air conditioning repair services at competitive prices and a level of professionalism that you won’t find elsewhere. We understand how disruptive air conditioning problems can be to your business or your family. Our goal is to get your system back up and running as soon as possible, so you can get back to your life! If you need professional residential or commercial AC repair services in Flowery Branch, you can trust the experts at our fully licensed, bonded and insured HVAC company. Our company employs a team of experienced HVAC technicians who are highly trained to repair all makes and models of air conditioning systems. Before we perform any repairs on your system, we will perform a complete diagnostic evaluation. Once we have determined the problem, we will offer you the full cost of the repairs or, if needed, the cost to replace your system. Should you need to replace your air conditioning system, our knowledgeable technicians can help you select an energy efficient model that is tailored to fit your specific needs. Our professional air conditioning company proudly serves commercial and residential clients in Flowery Branch, GA with top quality HVAC services offered at reasonable prices. If your air conditioning system is in need of repairs, please give us a call today to schedule an appointment. For the convenience of our valued clients, we offer financing options through GE Money. We also offer seasonal specials and special discounts. Please call our office to get more details. We look forward to serving you. 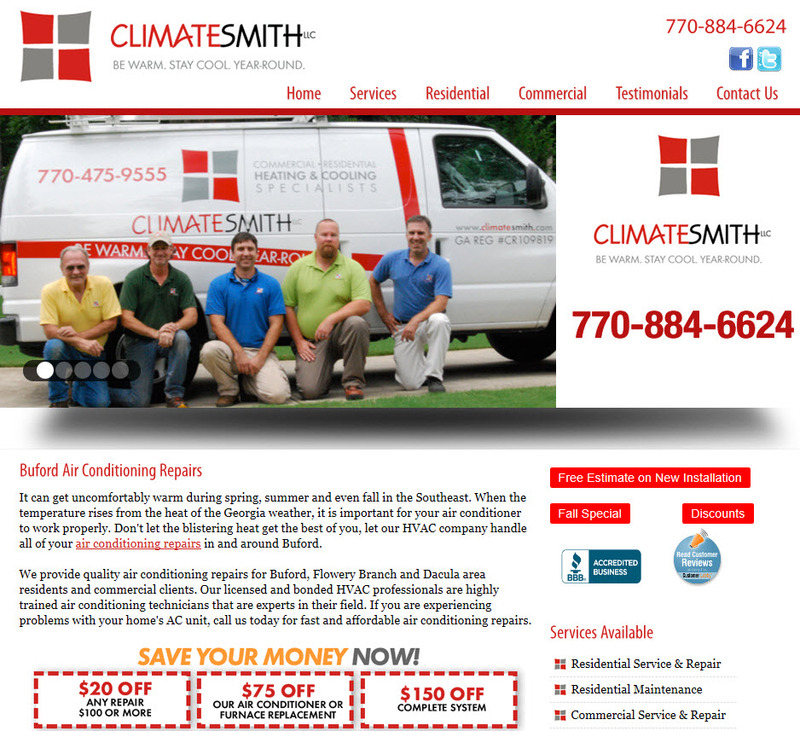 ClimateSmith, LLC serves residents and business owners in Buford, Flowery Branch, Hoschton, Dacula and the surrounding areas with top quality HVAC services.